I informed NSA about the recovered $50m, suspended NIA DG tells Osinbajo’s panel – Royal Times of Nigeria. 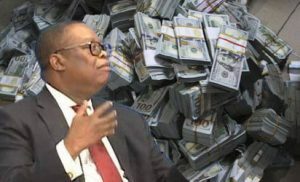 Suspended Director-General of the National Intelligence Agency, Ayodele Oke told the Yemi Osinbajo-led panel investigating the recovery of $50m recovered from an apartment in Ikoyi Lagos, on Monday that a memo was written to the National Security Adviser (NSA) on the custody of the cash for covert operations. The panel was questioning the suspended Director-General of the National Intelligence Agency, Ayodele Oke and some top officials of the agency for the second time. A source privy to this information said Oke claimed he informed NSA, Maj.-Gen. Babagana Monguno, who is a member of the committee. “What the committee did was to sieve through heaps of documents submitted by the EFCC and the NIA on the $43.4million. “After analysing these documents, the committee started interacting with some top officials of NIA. Thereafter at about 5.40pm, the interaction with Oke then started.